Take a good, long look at the woman in this Oklahoma driver's license, because she is your new hero. Hammond says she did it to make a statement. 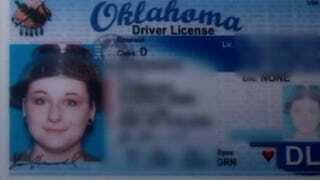 Under Oklahoma laws, your driver's license picture cannot have shadows and your face cannot be obscured. The colander met the requirements. Hammond is an atheist, but she told the department of motor vehicles that she is a "pastafarian." She says she believes no one should be forced into religious beliefs. "For me the colander represents freedom, our freedom of religion and to whatever religion we prefer or even lack of religion," she said. The Flying Spaghetti Monster is on this day appeased!